Dr David Kram‘s latest Mini-Ring Cycle production. Welcome Back 2009 Winner Christopher Busietta from Germany after his one year engagement at the Hessisches Staatstheater Wiesbaden. Christopher will entertain you with his latest repertoire and tales from Germany. He will present excerpts of Lortzing, Wagner, Mozart and more. The best of Wagner’s epic woven together by David Kram to a taut multimedia action with waves of groundbreaking immersive sound. Narrated and sung in English. Featuring the beginning and the end of the production, with Olivia Cranwell (soprano), Daryl Barclay (tenor), saxophone quartet, bassoon, keyboard and Bent Leather Band. The German-Australian Opera Grant successfully promotes emerging Australian Opera singers by launching their international career at the State Theater in Wiesbaden, a German A-Grade opera house. To date 7 outstanding opera singers went to Germany and our 2010 winner is about to leave in June to start her one year employment as a full ensemble member at the State Theatre. 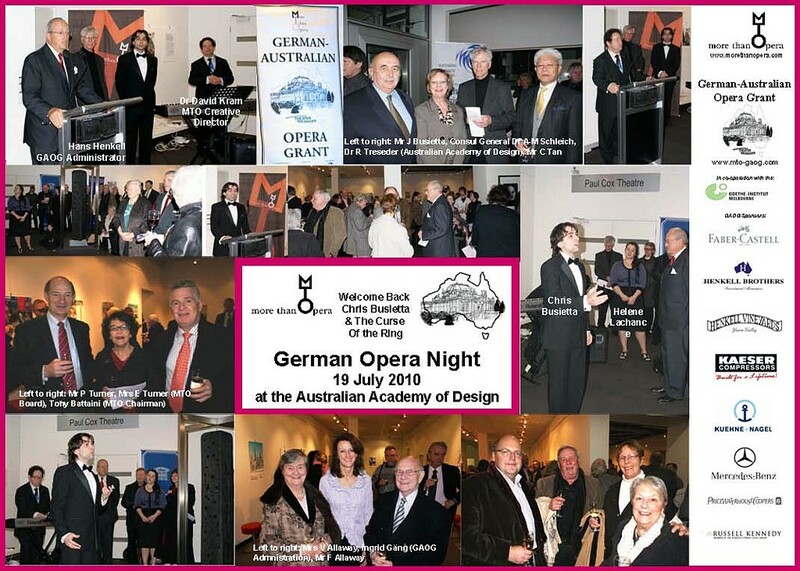 Enjoy Chris Busietta‘s (2009 Winner returning to Australia in July) arias from his latest repertoire and hear about his experience in the German opera world. Wagner conductor and expert Dr David Kram has condensed Wagner’s Ring Cycle into a one-hour production, which will premiere later this year in Victoria. This special occasion features the beginning and the end of the production with Olivia Cranwell (soprano), Daryl Barclay (tenor), a saxophone quartet, bassoon, keyboard and Bent Leather Band.